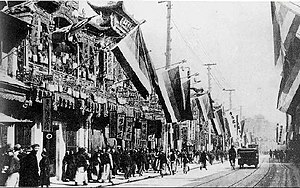 Dooble Ten Revolution in Shanghai-Nanjing Road (Nanking Road) efter the Shanghai Uprisin, hung wi the Five Races Unner Ane Union flags then uised bi the revolutionaries in Shanghai an Northren Cheenae. The Xinhai Revolution (Cheenese: 辛亥革命; pinyin: Xīnhài Gémìng), an aw kent as the Cheenese Revolution or the Revolution o 1911, wis a revolution that owerthrew Cheenae's last imperial dynasty (the Qing dynasty) an established the Republic o Cheenae (ROC). This page wis last eeditit on 3 Dizember 2018, at 01:41.